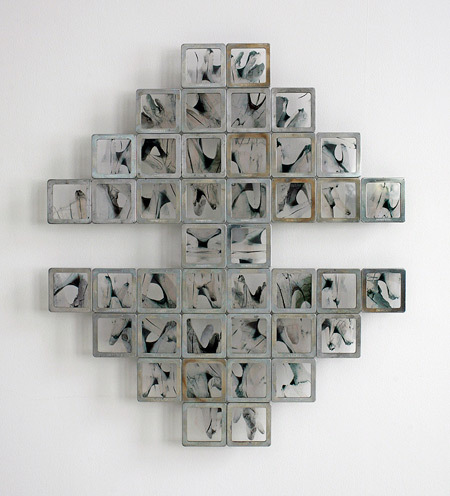 Alan Bur Johnson, ''Murmur: Cinquain,'' steel, glass, photo transparencies, 24 3/4 x 22 x 1 1/4''. Alan Bur Johnson crosses the divide between art and science with his meticulously arranged wall pieces using laboratory-like slides of insect parts, animal teeth and other biological specimens. Not only that, Johnson turns the pieces into subtle kinetic sculptures by letting viewers wave a hand across the lightweight, sand-dollar-size slides to see how they dangle, perhaps in an effort to reinforce our tenuous ties to nature. “Murmuration 18:49:02,” which stretches 116 inches, consists of hundreds of insect-wing images contained in 504 thin metal frames, held slightly away from the wall by dissection pins. When viewed at a distance, the piece yields colors and shapes resembling a bird in flight. But there must be a bit of the mad scientist in Johnson; he takes pains to denote in the piece’s title the hours, minutes and seconds it took to create it. Upon installation, he and helpers spend several additional hours per piece assembling the slides on the wall according to a template. Still, the artist's whimsy shines through in a piece like “Pollinium,” 71 inches high and consisting of 266 photo transparencies that come together in an image hinting at a plant bursting with pollen. In other pieces, Johnson adds to his aesthetic by borrowing from the structure of poetry. “Murmur: Cinquain” takes slides of deer teeth in antique steel frames and arranges them to resemble the order of syllables and lines in a mirrored cinquain. Johnson also appropriates the haiku form to good effect in two other works in the show. While living in Seattle in the ‘90s, Johnson exhibited throughout the Northwest. Now part of a sizable artists' colony in the mile-high, old mining town of Jerome, Arizona, he works in a re-purposed chemistry laboratory. It’s through not only the installations but also prints and drawings that he delves into anatomy and insect studies. But the resulting abstract images carry the day, reminding us of the rhythms and murmurs of life, death and regeneration that often go unseen.